I got another eggplant in the Box Of Wonders last week, and decided it was time to pull the trigger on eggplant Parmesan. Now, at this point, you may be thinking, “Gosh Jackie, well done. Way to step outside your comfort zone. This CSA thing is really making you…” Nope. I was utterly intimidated by the eggplant and recruited my roommates in order to spread the blame around if we ended up with a mushy, unidentifiable mess. If we failed, at least it would be failure by committee. You know, like Congress. Unlike Congress, however, we did actually want to do some research and have someone knowledgable to look to for guidance. 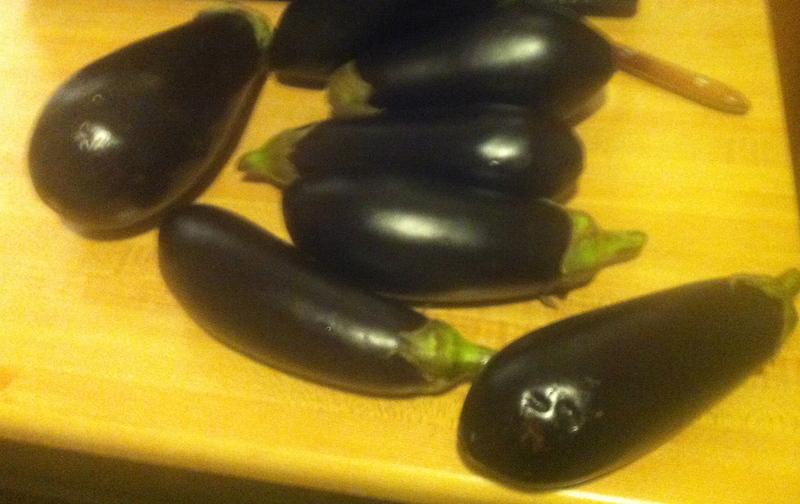 So, we dug through the cookbook trove and found ourselves an eggplant parm consultant. Solanum melongena. Nightshade family. Inanimate, yet subtly intimidating. Don’t pretend you don’t know what I’m talking about. Tonight was a weird night from a culinary standpoint. I had just picked up the latest Box of Wonders, and found dandelion greens and kale inside. I am still working through last week’s kale and I had an entire green cabbage staring at me accusingly from the “fresh” drawer in the refrigerator. So many greens. Something had to give. My buddies over at America’s Test Kitchen had a few things to say about cabbage preparation, so I decided to dispatch the cabbage this evening, for better or worse. They had two recipes, one for roasting cabbage and one for grilling it. I looked out the window at the five inches of snow on top of the grill and decided I would try both seasonings, one on each half, and roast it all. Why not. And while we’re on the subject, if you haven’t checked out America’s Test Kitchen, get there. Watch the show, read the magazine, get the book. 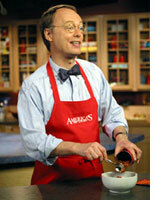 Christopher Kimball et al will show you how to not screw up any and every recipe. I actually saw him at my produce market a few months ago and I almost fainted. I was following him at a discrete distance to try and confirm it was him when I saw a woman turn to her husband and start pointing wildly. I ran up to her and squeaked, “It’s him isn’t it? !” She grabbed me by the shoulders and yelled, “It totally is!” And we proceeded to flip out like two 14-year-old girls at a Justin Bieber concert, while her husband and son looked incredulously on and Christopher Kimball walked to the parking lot, none the wiser (Thank goodness. I don’t need a restraining order on my permanent record). 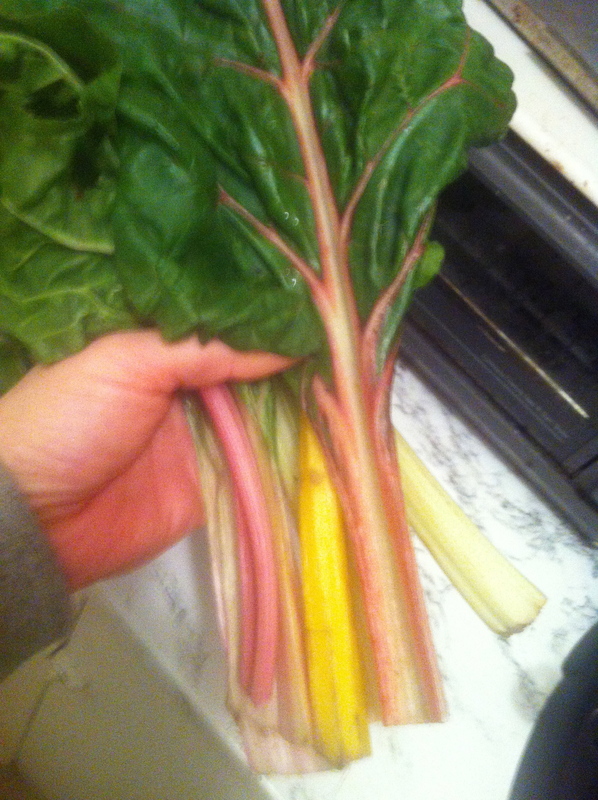 So I got a bunch of rainbow Swiss chard this week, so-named because of the multi-colored stalks. Swiss chard reminds me of kale in that it has huge leaves with lots of kinks and ruffles, so there is a lot of surface area and a little goes a long way. That’s really where the similarity ends though: Swiss chard is mild enough that you can eat it raw, and tender enough that you hardly need to cook it to include it in recipes, whereas kale, lovely green that it is, can be tough and bitter if not prepared properly. These are learnings gained from working chard into three different meals this week. A little really does go a long way. So as I said, three meals. 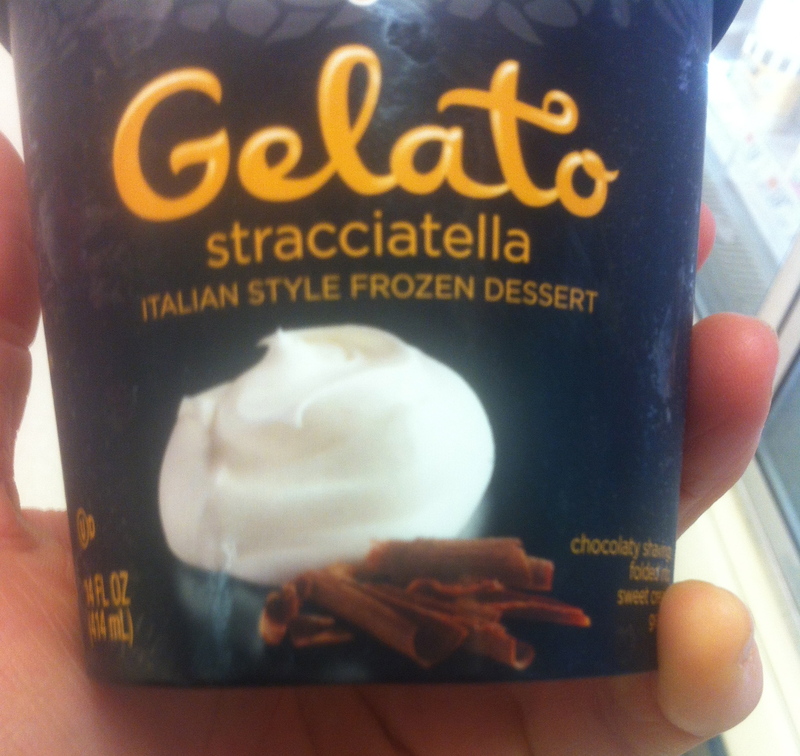 First up: Stracciatella! As you may know, stracciatella is a flavor of Italian gelato in which layers of shaved chocolate are folded into vanilla gelato.